﻿ Learn Burmese Language: learn to describe your feelings, mind and mental states, emotions and psychological states. In order to better understand the Burmese mind, I must include some aspects of boat-da1-ba2-dtha2 (Buddhism), as approximately 85% of the population in this country are Buddhists, and Burmese culture is influenced by Buddhism. Myanmar Grammar Notes: The particle chin3 or hmu1 modifies verbs to nouns in several words. Such words are more often seen in literary form. 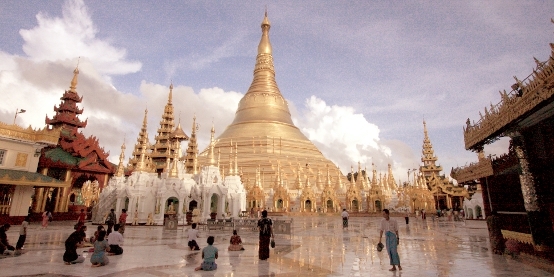 In spoken Burmese, the verb portion is usually used in combination with other words in phrases. For example, sate-pu2 chin3 is a worry (noun). The verb portion sate-pu2 can be combined with the present participle forming particle nay2 and the ending affirmation word deare2 to form the phrase sate-pu2 nay2 deare2 meaning He/She is (or I am) worried. If we don't constantly guard our minds, we are simply swept away by the flood of those emotions, which often result in negative cycle of effects and consequences. While we cannot avoid those worldly conditions, our conditioned responses and emotions are optional that are within our capability to control and "re-program" with practice. sate hloat sha3 nay2 deare2 -- (He is/ She is / I am) excited. ma2-na1 kji3 deare2 -- He/she has a big ego. de2 lu2 dau3-tha1 kji3 deare2 -- He is a wrathful person. He is someone who cannot control his anger. Myanmar Grammar Notes: dau3-tha1 | anger (noun) + kji3 | big (adjective) = dau3-tha1 kji3 (verb) = be exceedingly wrathful. late-pya2 ma1 thun1 bu3 -- I (or someone is) feeling guilty. de2 lu2 ba1-win2 myin1 deare2 -- He is a haughty person. ji3 -- suffix parfticle to mean "big" and "considerable". sate pu2 nay2 deare2 -- I am worried. thu1 a-twet sate pu2 nay2 deare2 -- I feel worried about him/her. sate ma1 pu2 ba2 neare1 -- Don't worry! If there is just one word you that should remember from this page, it would be "sate". sate ma1 hso3 ba2 neare1 -- Please don't be angry with me. Myanmar Grammar Notes: sate-hso3 (verb) means to be angry is a compound word made of sate (noun) and hso3 (adjective). In negative imperative, negative particle ma1 is inserted between the noun and adjective. sate ma1 shi1 ba2 neare1 -- Please don't be angry. In another words, it's like saying: Please don't have the mind with anger. sate ma1 chan3-tha2 bu3 -- I am unhappy. In search of Happiness. [19 Seconds] The modern idea of happiness has thrill and excitement in it. Such agitated state of the mind is fleeting and unstable because of the impermanent nature of all existence. The Buddhist philosophy of true happiness is the state where you are free from the shackles of negative states of the mind such as worry, guilt, craving, range, jealously, and anxiety. Perhaps, we living in the modern time, can somehow find the middle ground where we find happiness in the modern world minus the extra burdens of the negative states of the mind. There is thrill and excitement in the later type of happiness. At the same time, such agitated state of the mind is fleeting and unstable because of the impermanent nature of all existence, says the wise. Sooner or later, we will have to part with conditions that make us pyau2 lite-da2 , and we are left with yearning - toun1-ta1 sate (yearning) and struggle for the constant supply of the thrill, and if we can't get it, we end up saying : sate ma1 chan3-tha2 bu3. ba2 bu3 -- polite negative ending word. sate ma1 koun3 ba2 bu3 -- I'm sorry to hear that. This is a useful phrase to sympathize with someone. Do you find this sate-win2-za3 sa1-ya2 ? Do you find this lesson sate-win2-za3 sa1-ya2 | interesting? If you remember, back in lesson 20, sa1-ya2 roughly means "matter". Sate-win2-za3 means "having interest". So, sate-win2-za3 sa1-ya2 (noun) is something interesting. In deep analysis of the word sate-win2-za3, it could mean that whatever the state of the mind of the author is within you, and information or the knowledge has been transferred. In another words, my spirit comes alive as you read this sentence, no matter where or who you are, and when you observe this. sate win2-za3 sa1-ya2 beare3 -- That's interesting! Perhaps, you find this mumbo jumbo extremely boring. "Feeling bored" in Burmese is nyi3-ngway1. You can say: nyi3-ngway1 la2 byi2, which means "I've started to get bored." Myanmar Grammar Note: la2 (verb) meaning "to come" is used here as a particle meaning "started to". Another example: mo3-ywa2 la2 byi2 -- It starts raining. sate hna1-lone3 shwin2-lun3 chan3-myay1 ja1 ba2 zay2 -- May all beings free from distress and find happiness!